I made the quilled elements of this card for another project, but the colours were not 'right', so they got saved for what turned out to be this card. The flowers were mounted onto a dotted circle cut and embossed with a Spellbinders die and sponged with Tsukineko Pearlescent Lavender ink. This was then mounted onto the base which had been designed using the Card Patterns challenge for this week, and includes some lace and ribbon. A quilled butterfly was added along with some mauve rhinestones on the wings and in the corners. 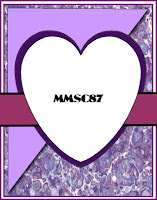 The sentiment was stamped in violet ink and clear embossed. P.S. Remember to keep February the 23rd free for the cake decorating Party - it is going to be soooo much fun, and we will not over eat, as it will all be eye-candy :-) How sweet is that!! Thanks for visiting, and may your day be blessed. Out of my Comfort Zone!! I found a small 2011 calendar on the internet (and forgot to note where, and now cannot find it) that printed out onto a single A4 page. I remembered a canvas that I had bought years ago, and thought I would 'have a go', and this is the result. The calendar was cut into the small pages and held together with small split pins, that went through the card behind it. The lace pattern was made by taping down and sponging a piece of lace with ink - Tsukineko Brilliance Pearlescent Orchid. Next step was to stamp the top right corner - I used a clear polymer stamp from Layers of Color from the Merci Bouquet set, and when I stamped with it on the acrylic block, it only stamped in the corner. Big panic - I ended up taking the stamp off the block and pressing it straight onto the canvas. I was so pleased I had chosen that stamp as it was possible to do that!! I then painted the image with other inks in the same range - thyme green, lavender and platinum planet. Next came the dragonfly - a purchase from the local Warehouse, from memory. this was attached with white PVA glue. The calendar was then attached using the ubiquitous double sided sellotape. I was still not happy as the whole seemed a little bland, so I fossicked through a draw and found the last of a packet of Zva gems that were just the right colour, so after a certain amount of fidgeting, I got then to form the flight pattern of the dragonfly, and a wee highlight in the top and bottom right hand corners. The final detail was the ribbon - there was not quite enough to do what I had originally planned, so it was glued around and then the ends were tied to form a loop to hang the calandar from. 23rd February - there will be loads of fun, and cakes galore, but the secret is that there are no calories, no sugar, no fats, nothing to harm you, just sheer pleasure and loads of eye candy!! Welcome to all my visitors -just a quick post this time as I post a card I have made for the Midnight Madness Challenge - I have taken some liberties with the sketch, but that is allowable as long as the basic sketch is recognizable. I chose to work with stamps from Layers of Color, using the Nature Walk set, and chalks. My lovely neighbour who has dabbled in art over the years gave me all her artist quality chalks the other day, so my colour range is quite amazing - a huge step up from what I previously had to work with!! I used pink for the base cardstock and wanting something subtle for the lower section as the dp is so quiet in its design, I put it through the cuttlebug in the leafy branch embossing folder, which was just what was needed. I then cut the dp to size and ran the edges over a lavender ink pad. The flowers were stamped twice in the same lavender ink, once in the circle area that I wanted to use, and once again on some other card to cut out and mount over the original images, after colouring. Despite the colour the camera had picked up, the flowers are actually a strong purple colour with a cyclamen accent. The layered flowers were mounted with a thin dimensional adhesive, and the leaves with double sided sellotape. The edge of the feature circle was rubbed over a red ink pad to give it definition, and the sentiment was stamped in the same ink. The whole was them assembled and the the pearls added to complete the card. Greetings to all my cyber visitors again. I made this card as an order - but as I know the recipient, it was specifically designed - and I enjoyed the making of it. I started knowing that the person it was intended for is an embroiderer, and she has a delightful sense of humour, so I went to this Bug-a-boo stamp Stella Sew, coloured her with chalks and added glitter, and dimensional glue for her glasses lenses. The sentiment (unknown) was stamped on a scrap of apricot card and embossed in gold, and stitched under the edge of the image. As you can see I sponged the edges of this panel and stitched it to the background paper, which was part of a pack from the Warehouse. To give the dp some life I spayed it with silver Radiant Rain (part of the twinkling H2O range), and also sponged the edges with Tim Holtz tea stain ink. This was mounted by sewing it onto the base of dark cream card stock. and pearls were added for a little panache. This was a fun card to make, once I got the colours to 'work'. Never mind, enough of my prattle :-). This tag started years ago, and was abandoned (for good reason when I first resurrected it - it was very, very basic). What has eventuated is far from the original, which is the orange layer you can just see the edge of!! I was inspired to 'have another go' by Gunn when she did a 12 days of Christmas tag challenge and shared it on her blog. I started to revamp the original by cutting a white layer, stamping a bird from the Royal Bird stamp set from Layers of Color and embossing it in white. The background was then sponged in a couple of shades of blues from the Tsukineko Kaleidacolor Rainbow pad Blue Breeze. Not satisfied I then painted the bird with twinkling H2O's and added Crystal Kindy Glitz, and then painted it again. Next the bird was masked and a Crazed background stamped using Tsukineko Platinum Planet ink. The flowers and beads were from my stash, as were the rhinestones and thread of glitter. After the edges were rubbed on an orange ink pad, and mounted on the orange layer it languished on the desk for another month as I was not pleased with it. Then my mojo returned and it was layered onto the cream card, which had had the base edge punched with a Fiskars border punch and the edges distressed and sponged with Tim Holtz Tea Stain distress ink. The 'thread' was replaced several times before I settled on the cord and lace combo. Then along came the Midnight Madness Challenge which meant using a tag, and presto I have one ready!! I selected my dp from a pack from The Warehouse (USA readers think Michaels), sprayed it with silver spray (Luminarte Shimmering Mist) ran it through the CB in the fleur de lise folder and mounted it on an aqua coloured card. As the folder does not quite go the length I require, I added some ribbon to cover the 'blank' end. I then used some organza to form a fancy bow with some silver reflective ribbon I have on hand, and glued a full bow on top of that. I suspect I have broken all the 'colour rules' in this, but I am satisfied with the outcome - finally. Thank you for visiting and being patient with my 'womblings' on this entry. May your day be blessed - as mine has been, by good news! Greetings to all my cyber visitors. The cards that I am sharing today were not easy for me to make as they are for members of a family with whom we have shared a lot of life with. My (adult) children grew up with their children, and we are all grieving the loss of their husband/father in an accident. I took the Midnight Madness Sketch Challenge as the starting point for this first card, and the fact that I found some gold trimmings that would 'work' for the end pieces was the next step. The image (from Our Daily Bread Designs) was stamped on water colour paper using aqua-crayons direct to stamp, and the same crayons were used for the background. The sentiment was stamped and embossed - not the best embossing, partially due to the paper I was working on. I was glad to be able to use the pearls and the bow to soften the look of the card, as without them it looked rather stark. The double ric rak was the final detail. The panel that the main image is mounted on is a lovely paper that came in a pack I was given as a gift, and has a beautiful sheen on it. Then came a second card, and again I was having difficulty trying to plan the card, so I ended up CASE-ING one from 'Lovely Linda'. 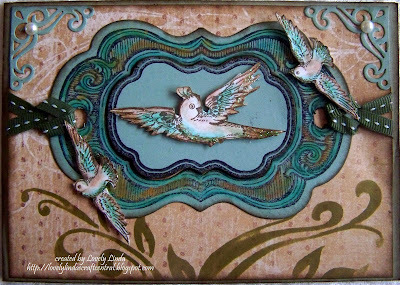 I then stamped the the Victorian Frame from Layers of Color onto a lighter green card, and coloured it with chalks, gold embossed the sentiment from Our Daily Bread Designs into the centre of that panel, then cut and embossed it using a Spellbinders Labels 14 die. The green pearls in the middle of the flowers were the final touch. Thank you for the inspiration Linda - I hope my CASE is acceptable. Yes, I am starting the year off with romance - this is a card for a couple who will shortly be celebrating their anniversary. I was a bit hesitant when I started this card as I was working to a sketch challenge, and the image was one that was given as a freebie to go with the challenge. Once I got going things seemed to come together quite well. The image is coloured with glitter pens and coloured pencils. This was cut out with a Nestie - the largest of the classic oval dies, embossed, pierced, and mounted on the largest of the scalloped oval dies, with the silver ribbon between the layers. The offset oval to the sides, with the pearls on, was a slightly smaller oval from the same set, cut out of silver card stock and split in half to give the elongated appearance. I matched these by cutting the corners of the same card stock, using the Cuttlebug Vintage Corners Die, and adding a matching pearl. Although it shows as blue in the photo, the dp is actually a lovely lavender with very soft images of roses on it, which you can just see in the above photograph. In the end I was very happy with this card, although it certainly challenged me in the making. Thank you for visiting my blog, and I do pray that you all have a happy 2011, filled with joy, love and laughter, and that you will prosper in all you do.